Long-standing conflicts have resulted in decades of widespread human rights abuses and land confiscations in Myanmar’s ethnic border areas. Both the Tatmadaw and Ethnic Armed Groups are responsible for confiscating land. In a country where 70% of the population is dependent on agriculture, land confiscations have serious, long-term consequences on the lives and livelihoods of ethnic communities. The total number of acres that were confiscated by armed actors and private companies in recent decades is unknown, but estimates are in the millions. In 2016, the Upper House’s Farmers Affairs Committee put the number at over 2 million acres of land. 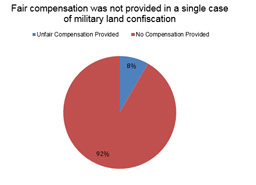 Estimates for military land confiscations are difficult to obtain because victims often fear retaliation by perpetrators for reporting the confiscations. With the signing of the Nationwide Ceasefire Agreement in 2015 and the relative stabilisation of several conflict zones, rural communities assumed that land previously confiscated by armed actors would be returned to them. This expectation has not been met. When the National League for Democracy took office in March 2016, it created the ‘Central Reinvestigation Committee for Confiscated Farmlands and Other Lands’, and declared that it would solve all land confiscation cases within six months. Although the body claims to have settled thousands of claims, thousands more remain unresolved. In July 2018, Tatmadaw Colonel Zaw Min stated, “the military has been returning many acres of land – as much as it can.” Yet thousands of subsistence farmers continue to face livelihood challenges, and hundreds of communities still live in fear due to the close proximity of armed actors to their villages. The restitution of land by armed actors to farmers is an essential step to the realisation of peace, justice and reconciliation of Myanmar. Yet, instead of taking steps to strengthen land tenure rights in ethnic minority areas, the Myanmar Parliament has recently passed amendments to the Vacant, Fallow, and Virgin Lands Management Law that could strip millions of customary farmers of their lands. This News Bulletin explores the dynamics of military land confiscations in Southeast Myanmar. It first focuses on analysing the legal framework around land rights, to assess the extent to which it prevents or facilitates land confiscation by armed actors. The second part analyses the characteristics of land confiscation on the basis of 26 cases documented by KHRG, with a particular emphasis on the corresponding human rights violations and the negative impacts on affected communities and displaced persons. Finally, the report highlights four case studies in order to raise the voices of victims and highlight the devastating and multiple effects of land confiscation on ethnic communities. In this report, the Karen Human Rights Group defines military land confiscation as an instance where an armed group has seized land that was traditionally used by a community or a community member, regardless of whether that user has a land title. This broad definition takes into account the predominance of customary land tenure in Southeast Myanmar and acknowledges the long-term impacts of land confiscation by armed actors on civilian populations. KHRG has also received many reports of land confiscated by individual soldiers and chooses to define these as military land confiscations as well because victims are likely to be intimidated by these actors. KHRG trains local community members to document human rights conditions in Southeast Myanmar. In 2017 and 2018, KHRG received 91 reports of military land confiscations in this region. This News Bulletin is based on analysis of these reports, which provide information on 26 different cases of land confiscations by armed actors. Land governance in Myanmar is regulated by a complex framework of over 70 laws, some dating back to the British colonial era. Article 37 of the 2008 Constitution states that the Union is the ultimate owner of all lands and natural resources. It also states that the Union shall “permit citizens right of private property” in accordance with the law. Land in the country is therefore not available for permanent private ownership, but the State can grant permissions to occupy and use lands. The 1894 Land Acquisition Act enables citizens to acquire land deeds in the form of a land grant. However, the LAA enables the government to reclassify and reassign land for “public purpose”, a loosely defined term. In practice, this framework enables the Tatmadaw, which still controls the ministries of Defence, Home Affairs and Border, to engage in land confiscation with total impunity. Amendments to the LAA are currently being considered by the Parliament to bring it up to international standards. However, the Myanmar Centre for Responsible Business has recommended that the government pause further consideration of a new LAA until it has discussed and adopted a land rights law that recognises and protects customary land tenure, which remains important in Southeast Myanmar. In March 2012, the Thein Sein government adopted two land laws that, according to the Transnational Institute, “set the legal framework for large-scale land grabs.” The Farmland Law and the Vacant, Fallow and Virgin Lands Management Law respectively prevent the registration of customary lands and enable the government to reassign any land that is being used or occupied without having been formally registered. They have exacerbated existing land-related problems in Southeast Myanmar by causing more land tenure insecurity; and they have paved the way for more confiscation of customary land, notably by armed actors, by legitimising their actions. Section 9 of the 2015 Nationwide Ceasefire Agreement states that the Tatmadaw and Ethnic Armed Organisations shall avoid forcible confiscation and transfer of land from local populations. They must also avoid forcibly taking property, labour or services from civilians. 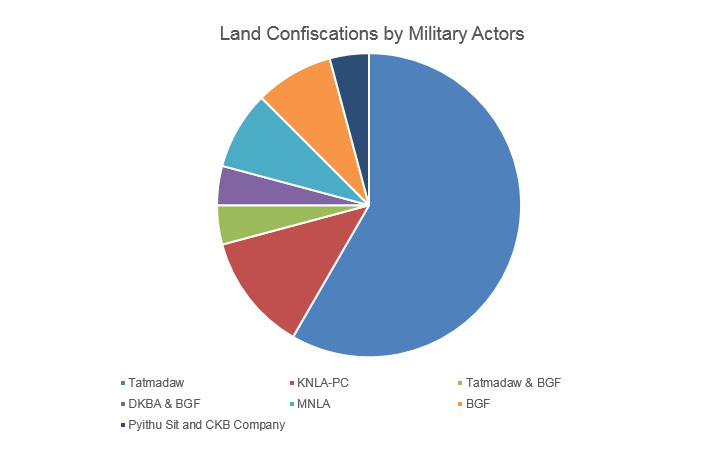 However, three of the land confiscation cases documented by KHRG were perpetrated by the Tatmadaw or its affiliated Border Guard Forces after the signing of the NCA, highlighting that it remains an ongoing problem. In January 2016, the Thein Sein government adopted a non-binding National Land Use Policy, which was drafted in cooperation with local and foreign experts. The NLUP is regarded as one of the most socially progressive policies in Myanmar. Its main objectives include recognising and protecting customary land tenure rights and procedures of ethnic nationalities, developing and implementing fair procedures relating to land restitution, and the development of a National Land Law (NLL). The NLUP states that customary land tenure systems shall be recognised by the future NLL (section 64), which shall also contain provisions on the reclassification, formal recognition and registration of customary land use rights relating to rotating and shifting cultivation that exists in farmland, forestland, vacant, fallow or virgin land (section 70). Section 74 also states that adequate land use and housing rights shall be systematically provided to ethnic national who lost their land resources due to land confiscation, in accordance with international best practices and human rights standards. However, progress on the implementation of the NLUP and the enactment of the NLL has stalled. The National Land Use Council (NLUC), which was established by the NLUP to coordinate the drafting of the NLL, only held its first coordination meeting in April 2018, more than two years after the adoption of the NLUP. The Union Attorney General’s Office said that it had already prepared a draft NLL, but its content has not been disclosed as of November 2018, and the drafting process did not involve consultations with civil society actors. In October 2018, Second Vice President and Chair of the NLUC U Henry Van Thio stressed the need to implement the objectives of the NLUP through the adoption of the NLL. In order to fully protect the land rights of indigenous people, it is of paramount importance that the government takes the necessary measures, in cooperation with relevant civil society organisations, to speed up the drafting and subsequent enactment of an NLL that is consistent with the provisions of the NLUP. In particular, the future NLL should put a strong emphasis on the creation and subsequent implementation of procedures to ensure that victims of military land confiscation get their lands back. As things currently stand, such a law would be the first to legally protect the customary land use rights of ethnic communities. In Southeast Myanmar, the following armed actors are responsible for land confiscations: the Tatmadaw, Border Guard Force (BGF), the Karen National Liberation Army – Peace Council (KNLA-PC), the Democratic Karen Buddhist Army (DKBA splinter), as well as the Mon National Liberation Army (MNLA). In certain cases, Tatmadaw soldiers were also accompanied by members of Pyithu Sit, a type of local level militia. The majority of these armed actors are signatories of the NCA. In roughly half of the land confiscation cases reported to KHRG, the affected people described human rights abuses connected to the incident. Common human rights abuses included forced displacement, property damage, intimidation and threats to put pressure on communities to abandon their land, and forced labour (particularly in cases involving the KNLA-PC). Some landowners are threatened by soldiers and forced to give up their lands or sell it at unfair prices, such as the case of a farmer in Tavoy Hkee area, Mergui-Tavoy District who was threatened by Mon National Liberation Army (MNLA) soldiers. In 2008, the MNLA forcefully confiscated 30 acres of lands belonging to a local farmer. He continued to go to his plantation because he did not want to give up his lands. Then, six soldiers from the MNLA approached him with weapons and forced him to leave. Finally, he was forced to sell his land to the MNLA for minimal compensation. In rare cases where armed actors have had consultation meetings with the local community, the meetings were coercive by nature. In Shwe Ko Ko, BGF soldiers are intimidating local people to hand over their land for inadequate compensation. This is connected to the Chinatown project, a resort area being developed next to the Moei River which separates Myanmar from Thailand. The main investor, the Chinese state-owned company Jilin Yatai Group, has signed an agreement with BGF officials to build luxury housing, hotels, shopping centres and several casinos in this area. Affected communities only received some form of monetary compensation in 2 of the 26 cases of military land confiscations reported to KHRG. Fair monetary compensation, equivalent to the market value of the land and the loss of income sustained by a household, was not provided in a single of those cases. In a case affecting farmers close to Nay Pyi Daw Union Territory, the Tatmadaw confiscated the agricultural lands of an entire village tract. Households in more than eight villages were affected. Instead of providing compensation for the loss of agricultural lands, the main source of food and income of this community, the Myanmar government built poor quality housing, which was entirely inadequate for people to live in. Providing low-quality, unfinished housing to households affected by land confiscations does not mitigate the negative effects of the loss of agricultural lands. In addition of depriving the residents of eight villages of their main source of income, the Tatmadaw took this opportunity as a money-making venture, asking local households to rent the land that had been confiscated from them for 40,000 kyat (USD $26.5) per acre. This case is just one instance of a larger trend. The types of lands confiscated mostly include plantations, paddy fields, lands that people have built their houses on, community forest land, and fallow land. Losing the land with one’s house means almost inevitable displacement. Losing agriculture lands means an inevitable loss of livelihoods, loss of incomes and loss of investment in cash crops. Losing community forest lands can result in environmental problems, which can affect the livelihoods of local people. In some cases, the perpetrators used confiscated lands for military purposes, which led to inevitable security concerns for the local community, as put forward in Case Study 1 (below). Military land confiscations are also a barrier to refugee return in two ways. They violate the Pinheiro Principles, which state that displaced persons have the right to return to their homes and their lands. They also fuel a climate of fear, discouraging displaced persons from returning to their villages of origin because of the presence of armed actors. Since 1999, Tatmadaw battalions from the Bu Yin Naung military training camp #7 and Military Operations Command #13confiscated more than 4,000 acres of community plantations from seven villages in Shouk Pin Chaung village tract. All of the households in Ywa Thit Gyi, Kyun Kon, Nan Tha Kon, Ngwe Toung Gyi, Ywa Kyi and Kyweh Hpyu Toung villages were affected. The lands that dozens of families relied on for their livelihoods are now being used as a military training ground for firing practice. Local farmers can no longer access the rubber plantations that they relied upon for their income. Most of the households affected by this land confiscation have adopted a pattern of cyclical displacement: living in their original village during a part of the year, and fleeing into the forest when Tatmadaw soldiers are present in the Bu Yin Naung military training camp. Many households lack other options to secure their livelihoods and continue to cultivate land that the Tatmadaw has confiscated despite the obvious security risks. A community member described to KHRG how the Tatmadaw soldiers threatened local farmers: “This land belongs to the local communities. The Tatmadaw trespassed onto our property and confiscated our lands. They are now benefitting from our agricultural lands. Tatmadaw warned villagers not to touch their rubber plantations. If they do not obey this order, the Tatmadaw will take action against them”. In March 2016, Major Kyaw Kyaw Lwin erected a signpost stating that the Ministry of Home Affairs had recognised the Tatmadaw as the legitimate owner of these lands. This has further decreased the confidence of local communities in the peace process and has dampened hopes of having their lands returned to them one day. In October 2016, 300 local farmers organised a protest in front of the General District Administrator and Forestry Department offices in Toungoo town. They wanted the Tatmadaw to stop threatening local people with weapons, to stop damaging their crops, and for their plantations to be returned to their owners. “We want our land returned to us. We do not want any financial compensation, we just want our lands back to secure our livelihoods”, said one local farmer. “Other villagers feel the same. We have suffered for over 20 years not having access to our land. Many people in our community had to leave our village to find work. Some have even gone to other countries. Some men work as mahouts in the jungle. Women have left the village to work as domestic workers. Some people ended up working in Toungoo Town, Yangon city, or even Malaysia or Singapore countries”. In addition to breaking down social ties in a rural community, this instance of land confiscation has affected the next generation. “Some children have not been able to continue their education because of the loss of income we have sustained”. This highlights the long-lasting effects of land confiscation on local communities, and how this type of abuse paves the way for further violations of their human rights. In 1993, the Tatmadaw confiscated all the community lands in Wai Naung village to build military bases for Light Infantry Battalions (LIB) #340, #341 and #434 (Strategic Operations Command, Hpapun Operations Command Headquarter #1). Several buildings have already been built. The Tatmadaw Ammunition Platoon based there confiscated more lands from local farmers when they repaired the fence around their camp. The General Engineering Platoon Officer also developed a brick-making business on the confiscated land to fund the battalions stationed in this military base. Some of the lands were also confiscated for agricultural purposes, a by-product of the Tatmadaw’s policy of ‘self-reliance’ which incentivises battalions to draw on the land, resources and labour of civilian populations. However, LIB #340, #341, and #434 did not make use of all of the land they had confiscated. In July 2017, Bo Hla Win, the Second Warrant Officer from LIB #340, began leasing parcels of land to farmers from neighbouring villages. A local farmer explained his view of the situation: “Tatmadaw soldiers confiscated our land, but they never had enough farming tools to till our soil. They did not really benefit from confiscating our land.” Therefore, the Tatmadaw deprived an entire community of their main source of food and income without putting these agricultural lands to use. He reported that this situation was actually causing some nervousness among the Tatmadaw, which led them to lease the confiscated land: “The soldiers were worried that someone might ask them why nobody is working on these fields. To avoid trouble, they leased the land to local people. They asked us to pay money to them, and give them some of our crops as payment. The Tatmadaw commander told us that if any outsiders or authorities questioned us, we should explain that we are working to help the Tatmadaw farm this land”. In 2001, the Tatmadaw higher military training school (Ta Ta Ka) #12 confiscated 687 acres of community land in P’So Oo village to build a training camp.P’So Oo village is located in a remote area where indigenous people rely on agriculture for their livelihoods and have no access to government land registration mechanisms. In 2000, Ta Ta Ka #12 had already confiscated all the lands in Naw Taw, a neighbouring village, displacing this population. The land confiscation in Naw Taw allegedly involved several instances of human rights abuse, including forced labour, arbitrary taxation and violent threats. From 2000 to 2002, community members from P’So Oo and Naw Taw villages were forced to work three days a week to build military buildings. In 2001, 49 farmers from P’So Oo were forced to sign documents transferring their land to the Tatmadaw. The people who refused to sign had to pay 2 million kyat (USD $1,329.26) per from 2000 to 2006, and 1.6 million kyat (USD $ 1,063.41) per year from 2006 to 2010, which increased poverty in the community. In 2012, the Tatmadaw ordered local people to cede their lands, saying that they would otherwise burn their plantations. 17 landowners complied. Since then, the Tatmadaw started putting posts on the trees saying: “Military-owned land, do not trespass”. Community members also fear that they might not be able to go back to their lands, as the Tatmadaw delimitated the confiscated areas with signs. The soldiers even told villagers that they had planted landmines in one area around the plantations. 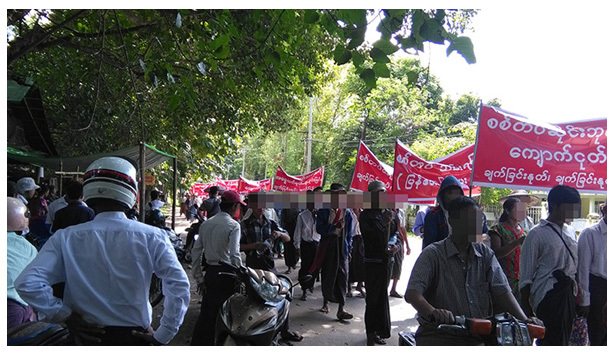 Some villagers confronted the Tatmadaw, and others took photos and reported the case to the authorities. Villagers also put signs on their lands indicating their name, the size of the plot, the type of crops and how many years they had been working on this plantation. The affected communities also reported this case to then-President Thein Sein, several ministries, the Joint Monitoring Committee (JMC), local authorities and the Karen National Union, but none of them have helped the villagers reclaim their lands so far. In 2004, the Mon National Liberation Army (MNLA), led by U Nyan Htun, confiscated more than 100 acres of local people’s lands in five villages of Win Yay Township. The MNLA unit involved is based out of Moh Ka Nay village. Most of the confiscated lands were rubber, cashew, betel nuts and rice plantations, but some of the lands were also fallow. At the end of 2004, MNLA soldiers confiscated the lands of local farmers of both Karen and Mon ethnicities. They told them that the national authorities had granted ownership of these lands to the MNLA. An affected villager from Bay L’Maing stated: “The MNLA said that they owned this land, so they confiscated them from us. We tried to protect our land and protest, but we were not successful because we do not have weapons. We are powerless civilians; the soldiers intimidated us and confiscated the land.” The MNLA developed a rubber plantation on some of the lands, using this cash-crop as a source of income for their armed forces. They also sold some parcels of confiscated land to ethnic Mon villagers. Fearing the presence of soldiers in the area, some farmers have left their villages. Most of the affected villagers held KNU land titles. The presence of two parallel land registration systems complicates matters for farmers trying to secure their land. Both the KNU and Myanmar government have been proactive in demarcating lands in Southeast Myanmar and issuing land titles. However, both actors fail to recognize one another’s land registration systems. This increases the risk of land confiscations in Southeast Myanmar. Local farmers have reported this land confiscation case to the KNU and Myanmar authorities, but they were not able to get their lands returned to them. They are worried for their future and the future of their children. Harmonising land registration systems in Southeast Myanmar would prevent rural communities from falling prey to military land confiscations. KHRG urges all the parties to the Nationwide Ceasefire Agreement to abide by its section 9 and to stop engaging in the forcible confiscation of land from local populations. -The appropriate steps are taken to ensure a nationwide application of the future law in cooperation with local governments and ethnic armed organisations. Voice of America (July 2018), “Myanmar Legacy of Land Confiscations by Military Persists”. Human Rights Watch (July 2018), “’Nothing for Our Land’ – Impact of Land Confiscation on Farmers in Myanmar”. Myanmar Centre for Responsible Business (August 2018), “MCRB’s comments to Parliament on the Draft Land Acquisition Act”. Transnational Institute (December 2013), “A Declaration of War on Us”: The 2018 VFV Law Amendment and its Impact on Ethnic Nationalities”. Frontier Myanmar (November 2018), “Bringing the land use policy to life”. The Republic of the Union of Myanmar – Ministry of Information (October 2018), “National Land Use Council holds 2nd coordination meeting”. Myanmar Times (October 2018), “Vice president says country needs National Land Law”. Pyithu sit translates to ‘people’s militia’. In some parts of Southeast Myanmar, local civilians are conscripted to serve in village or town militia groups. Karen Human Rights Group (August 2018), “Hpapun Interview: Saw Bb---, December 2017”. This information was taken from an unpublished report received by KHRG. Karen Human Rights Group (November 2017), “Nay Pyi Taw Interview: Daw A---, February 2017”. Karen Human Rights Group (May 2018), “Hpa-an Interview: Mann F---, March 2018”. For more information, see UN Economic and Social Council (2005), “Principles on housing and property restitution for refugees and displaced persons”. Karen Human Rights Group (January 2018), “Toungoo Situation Update: Thandaunggyi Township, June to August 2017”. The term ‘mahout’ refers to a person who tends an elephant in South and Southeast Asia.